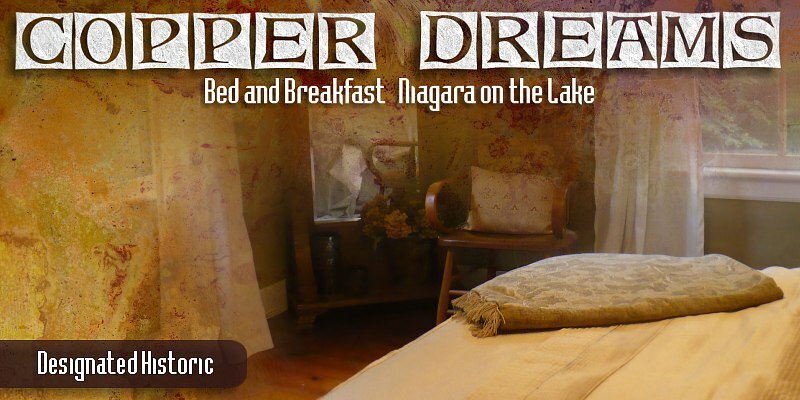 Welcome to Copper Dreams, in the heart of the Historic Old Town in Niagara on the Lake. We strive to present a relaxing, comfortable home, rich in all things that life in this glorious region has to offer. Copper Dreams proposes a mix of the historic and the modern, as this beautiful and notable home, circa 1870, fully renovated and restored, blends seamlessly with modern furnishings, artwork, technology, and amenities. Perfect central location in the Old Town, a true mix of historic and modern. A historic home circa 1870, completely restored and renovated in 2012. One block to shopping, dining, art galleries, spas, museums, parks and greenspace. One block to the Shaw Festival's Court House and Royal George theatres. Two blocks to the Festival theatre. Three blocks to the park at the convergence of the Niagara River and Lake Ontario. Large shaded veranda, with horse drawn carriages passing by. All new pillows, mattresses, and common area furniture. Guest rooms feature LCD TVs, Apple compatible radios, and free WiFi. Friendly, happy dog in residence, with restricted access to guest areas. Welcome to Copper Dreams, in the heart of the historic Old Town. 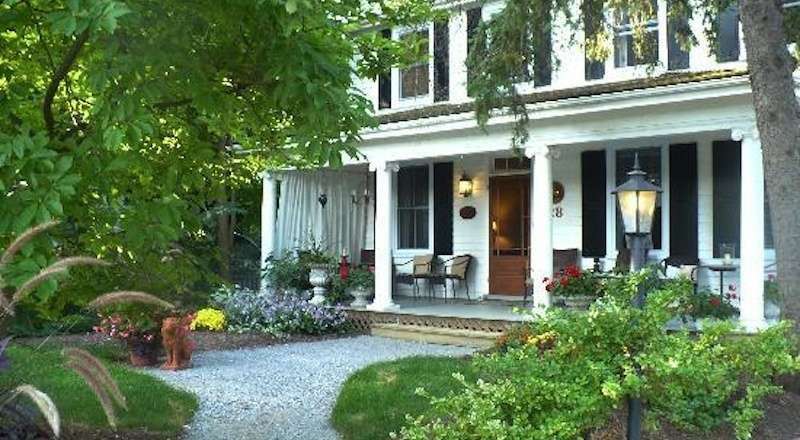 After a career in design in downtown Toronto, I have followed my passion for all things food, drink, terroir, theatre and Niagara, and opened this Bed and Breakfast, along with my faithful Samoyed puppy Kaiya, in 2013. I strive to present a relaxing, comfortable home, rich in all things that this region has to offer. Copper Dreams proposes a mix of the historic and the modern, as this beautifully renovated and restored home, circa 1870 and one of the historically designated structures in the Old Town, hosts modern furnishings, artwork, and amenities. Original plank floors, a large veranda and lovely antiques bring you to a time past, while the the common area is outfitted with new furniture and a 46 high definition television. Horse drawn carriages pass by our front door, while we offer free high speed internet access. The guest rooms feature all new hypoallergenic pillow top plush mattresses, duvets and pillows. Televisions, fireplaces, robes, iPhone compatible radios and seating areas are common to all rooms. Complimentary snacks and refreshments are available at all times. The multiple course breakfasts, alternating between sweet and savoury, are offered in the dining room or on the veranda. If you would prefer something light and informal, please join us in the kitchen. We are obviously responsive to food allergies and sensitivities, as well as likes and dislikes. We source, present and promote all things local, including foods in season, coffees, and natural toiletries. Guests enjoy the use of the entire original house. Kaiya is limited to the apartment, unless invited into the common areas by the guests, and is not permitted in the bedrooms. Copper Dreams Bed and Breakfast is in its third full year of operation, and in 2015 we welcomed our dear friend and new associate Kelly. Her joy for living is infectious. She was raised locally, is well versed in the local culture, and her family often helps us around the house. We are licensed by the Town of Niagara on the Lake, and are members of the Chamber of Commerce and the Bed and Breakfast Association. Whether you are looking for some fun with a kindred spirit, a romantic get away, or a cultural adventure (or all of the above), Copper Dreams is a great starting point for your activities. We are located within easy walking distance of the three Shaw theatres, one block from shopping, spas, galleries and museums, and surrounded by historic sites. All things culinary, from fine dining, to pubs, to coffee and gelato bars, and everything in between, are literally around the corner, and the lake is just a short stroll through the town. With ample free parking on site and wine tours stopping at our front door, use of your car is strictly discretionary. We are here to make this a relaxing, invigorating and memorable vacation, so let us know of any special needs or desires, and we will do our best to make your dreams come true! Our multiple course specialized breakfast is intended to satisfy the various wishes of our guests. Some people prefer a light breakfast, others, quite the opposite. The formal breakfast is served about 9:00am, either in the dining room or on the veranda, but if you would prefer a lighter, more informal breakfast, and perhaps would like to get an earlier start to your day, please talk to us. You are welcome to join us in the kitchen, while we prepare the meal for the other guests. Breakfast will vary throughout your stay, often alternating between sweet and savoury, and individually created dishes will be offered on occasion. Local and organic produce and ingredients will always be used, whenever available. Coffee beans, teas, jams, preserves and sauces are all locally sourced. Directions for Copper Dreams Bed and Breakfast, 28 Johnson Street, Niagara on the Lake. Copper Dreams is a two storey white clapboard home, with a large veranda and copper coloured brick drive, post light, and screen door. Coming along the QEW from Hamilton/Toronto, take exit 38B, Glendale Avenue North, to Niagara-on-the-Lake. At the end of the ramp turn right and go back over the QEW. At the lights (hotel and fast food outlets) turn left on York Road, and at the first set of lights, turn right on Airport Road. Go past the stop sign, driving a few minutes to the second stop sign. Make a right at Niagara Stone Road (#55). You will enjoy a 10 minute relaxing drive passing through the town of Virgil. Niagara Stone Road becomes Mississagua Street. Go through the lights at Mary Street, past William, Centre and Gage Streets. Turn right at the next street which is Johnson. If you miss Johnson you will end up on Queen street (the main shopping/dining experience) where you can take any of the side streets one block back to Johnson. Continue along Johnson past Simcoe, Gate, Victoria and Regent. Just past the lawn bowling greens on your left, you will find Copper Dreams on your right. From Buffalo, New York, follow the QEW towards Hamilton exiting at 38 Glendale for Niagara-on-the-Lake. At the end of the ramp, turn right, and then left on York Road. Follow the same directions as above. When crossing into Canada at the Queenston-Lewiston Bridge, follow Highway 405 to Stanley Avenue. Follow the signs to Niagara-on-the-Lake, which will take you through Queenston and along the Niagara Parkway. Follow the signs to Niagara on the Lake, and you will end up on Queen Street. At the Prince of Wales hotel, turn left onto King Street. It's a short block- turn right on Johnson, and we are the third house on the left. Please call us at 905.468.7097 if we can assist you with further directions.